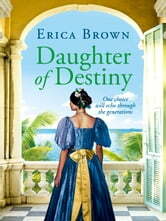 On a balmy night in Barbados, a female slave is made pregnant by the son of a plantation owner. The child, Blanche, comes of age but is left alone in the world when her mother dies. She is certain that Otis Strong, one of the plantation owner’s sons, is her father. He makes arrangements for Blanche to sail to Bristol where she will be taken in by his brother. Blanche sees it as a chance to learn the truth about her parentage and to reconnect with Nelson Strong, who she believes to be a cousin but with whom she is infatuated. Previously published as Like an Evening Gone by Jeannie Johnson. Perfect for fans of Dinah Jefferies, Renita D’Silva and Sharon Maas. An easy read, really enjoyed the characters in this book. Really enjoyed this. Loved all the different storylines and twists and turns in each chapter. Will read more from this author. An Entertaining & Well Written Read. I really enjoyed this story. EricaBrown weaves historical events with her great story telling style. The book held my attention till the end. I am now reading the second book in this trilogy and loving meeting the characters again. I thouroughly recommend this book as a great read.